Call for Projects 2016 is now open! Pitch your ideas in front of marketers representing big brands and decision makers from venture capital funds. Please note that all the submitted project must be minimum viable product (mvp), which means their visible and functional features must be presentable. • Pitch your project on stage in front of decision makers and Filmteractive audience. • Let us participate in covering your travel and accommodation costs. We are publisching interviews with Filmteractive 2015 speakers, commissioners, participants and organisers! Watch the presentations of Filmteractive Market 2015 winners! Presentations are available on our You Tube channel. Watch Filmteractive 2015 video report! Presentations, pitching sessions, networking and interviews! Let's go throught it once again! Watch the Filmteractive 5th anniversary movie! 2011, 2012, 2013, 2014, 2015... 1427 participants, 96 presentations, 182 submitted projects... AND MORE! Meet the Winners of Filmteractive Market 2015! For the first time we have winners from Poland! Createrria turns making games into a game itself! Players can create their own games directly on mobile devices, share with friends and play others creations. There are hundreds of millions of players on mobile. Many of them are so engaged that they would love to become creators (like it happens with music or photo enthusiasts) – but on mobile there are no easy ways to create games. There were several attempts to “crack the code” on mobile but they are either hard-to-use developer apps or produce poor quality results. Createrria is different – its main advantage is being extremely fun and simple to use, allowing users to create excellent quality games (comparable to commercial AppStore releases) in very short time. Createrria users are not only engaged players but also kids and their parents. Thanks to strong creativity background it is a very good application for education purposes – both for preschool kids (general game creation) and game development students (level design education). Since its release for iOS (Apple mobile system) Createrria has been downloaded over 1.5M times, while its users have published 800k games, played over 65M times! Android version is coming summer 2015. Digital Stories - modern storytelling format that mixes narrative techniques of comics, tv shows and interactivity of games to tell engaging stories. Digital Stories is a format used to create modern entertainment, education and advertisement content. Built in a way that lowers entry barriers for various audiences. Simple handling enhances experience, smoothly leading through the content and invites to interact when it’s meaningful. Available for smartphones, tablets and computers with possibilities to bring them to consoles, smart TVs, VR headsets and internet browsers. The participants of Filmteractive 2015 learned about the newest trends in content marketing! Is there a place for washing machines in fashion industry? How is coffee related to content marketing? On the first day of the event, a business conference took place. It was addressed to representatives of the broadly understood business – starting from advertisers, through media, and finishing on representatives of creative industries. As every year, many great speakers representing well-known brands and media came to Lodz Film School, e.g. Villads Spangsberg (LEGO), Lovisa Sunnerholm (Electrolux), Oscar Colombo (illycaffè) or Amanda Farnsworth (BBC News). The main topic of the conference was content marketing, which many different sites were presented. Villads Spangsberg told how does he produces films and TV series for kids at his work for LEGO. He presented the whole creative process which every new collection of bricks has to come through. What is more, he showed some of his last projects and answered why everyone demands new sets devoted to Star Wars. Lovisa Sunnerholm, on the other hand, presented the new trend, which is green washing. „The Next Black”, film produced by Lovis, showed why taking care of your garments is more profitable than buying new ones all the time. Amanda Farnsworth let participants to have a sneak peek at the newsroom of the BBC, the most appreciated medium on Earth. She told very interestingly about the combination of the information with the most modern technologies. The second day of the Filmteractive belonged to young creators from all over the world. Ten of them showed their interactive ideas on a pitching session in front of jury: Amila Čirkinagić (The Financing Forum For Kids Content), Barbara Żbik (PayU), Romain Bonnin (France Télévisions), Bartłomiej Gola (SpeedUp Group), Maciej Binkowski (Techland), Amanda Farnsworth (BBC News), Anna Iller (Allegro Group), Robert Pratten (Transmedia Storyteller), Katarzyna Jezierska (PepsiCo), Monika Bednarek (miptv) and Marcin Połeć (The City of Lodz Office). The jury decided that Digital Stories and Createrria: Craft Your Games, two Polish productions, were the best. Also Spanish-Swedish Infinidie and Italian Mash&Co were appreciated. “The level of all submitted projects was very high, that’s why the discussion on who should win was long and fierce. Finally we decided that Digital Stories and Createrria: Craft your games need our support more than others”, said Maciej Binkowski (Techland). Main prizes were founded by Digital One agency and The City of Lodz. Additionally, authors of the best projects got invitations for the next year edition of the biggest fair on film and TV content – miptv in Cannes, and consultations with the SpeedUp group. Festival finished with films screenings. At first, participants saw the best videos submitted to Discovery competition: “Always curious: father and son”. After that two documentaries which conference speakers had mentioned were shown: “The Next Black” produced for AEG and “A Small Section of the World” produced for illycaffe. Pepsi competition was announced during Filmteractive 2015! Accept the challenge and make a 6 seconds video with a Pepsi can in the main role! Paul Kontonis from Global Online Video Association on Filmteractive 2015! Villads Spangsberg from LEGO on Filmteractive 2015! Starting his career as a foam sword fighting Pirate in LEGOLAND theme parks, this 2nd Generation LEGO employee has never stopped dreaming, and telling stories is the heart and soul of his life. For the last 10 years, Villads has worked for advertising agencies in Sydney, London, and Copenhagen, creating interactive engaging experiences through deep relatable characters, emotional stories, stunning visual universes and sharp direct messages for brands like Nike, Adidas, Discovery Channel, and now one of the world’s most loved toy companies, LEGO. As a Sr. Art Director at LEGO, Villads is responsible for bringing the products to life through games, web experiences, music videos, TV commercials, and animated TV series for the whole world of kids and adults to enjoy. Maciej Wróblewski from MUSE on Filmteractive 2015! Head of Analytics in MUSE. He manages analitical projects in a field of video communication in social media, specialising in market research of YouTube. Moreover Maciej conducts videomarketing trainings. He is a top contributor at Google help forums. The festival NInA Beta Version will be focused on new narrative strategies in culture, digital and interactive media and the depiction of archives from an affective perspective. The festival will also be a way to acquaint the general public with everything that the Institute has been doing for the past year. In 2015, as the doors to the newly renovated headquarters opened, NInA has become a space completely available to the public. NInA Beta Version will feature a panel discussion “between a story and a database” with Lev Manovich, one of the most important media theorists of the last decade, Jeremy Mendes of the National Film Board of Canada, and Dominique Willieme of ARTE. The panelists will discuss whether storytelling as fundamental cultural practice has run its course. Lev Manovich states that culture is shifting towards a database model, whereas the work of Arte and NFB is clear proof that the ability to mix and fuse media has launched a narrative renaissance. The theme of the festival is “digital stories”. You can learn more at www.nina.gov.pl. How to fight back economic crisis in Costa Rica? You will find the answer during Filmteractive Festival on 24th of September - come and watch with us " A small section of the world" by illycaffè! The film tells the story of a group of brave women from Costa Rica, who decided to fight back against the economic crisis in their small community by growing coffee. It is a tale of strength and femaleemancipation. The women of ASOMOBI and their coffee cooperative have created a sustainable modelthat can inspire everyone. The documentary was directed by Academy Award winner Lesley Chilcott, and produced by illycaffè. We have pleasure to announce Filmteractive Market finalists selected by our international jury! We can't wait to see all the presentations! Maciej Binkowski from Techland at Filmteractive 2015! As Filmteractive Conference speaker and as a member of Filmteractive Market expert panel. Consulting session with experts from SpeedUp Group! SpeedUp award for Filmteractive Market winners! Filmteractive Market submissions in numbers! We received 75 projects from 30 countries. Here you can see the list of most active countries. Robert Pratten CEO, Transmedia Storyteller at Filmteractive 2015! CEO, Transmedia Storyteller (UK) Robert Pratten is CEO and Founder of Transmedia Storyteller Ltd, creators of Conducttr – the pervasive entertainment platform. Robert's experience uniquely places him at the intersection of entertainment, marketing and technology: he brings more than 20 years’ experience as a marketing consultant and expertise in Intelligent Networks having formally advised clients such as Ericsson and Telcordia on international pricing, positioning and market entry strategies. In 2000, he left Europe’s leading telecoms consultancy firm to attend the London Film School and since wrote, produced and directed two award-winning, critically acclaimed feature films - London Voodoo (2004) and Mindflesh (2008). He also produced and the original transmedia proof-of-concept project for Conducttr, Lowlifes. Today he is an internationally recognized thought-leader in transmedia storytelling - regularly speaking at conferences including the World Innovation Conference, SXSW Interactive, FIPA, Storyworld and also to transmedia meetup groups to encourage and inspire a new era of independent creative thinking. He is author of the book Getting Started in Transmedia Storytelling: A Practical Guide for Beginners. At Filmteractive Conference he will present the following topic: An introduction to transmedia storytelling and inspiration for how brands can emploi it wisely. For Filmteractive Market we got 75 submissions from all over the world! On 15th July we have closed the Call for Projects. We got 75 projects from 6 continents. Now keep your fingers crossed for your projects to get selected for the final 8! Meet our new partner from Ukraine! We begin our partnership with Kiev Media Week – international media forum! We are glad to announce our first event partner outside the European Union: Kiev Media Week - international business networking platform for media industry professionals from Central and Eastern Europe. It is a range of events for top players of TV, movie, new media and other media businesses that gives an opportunity to meet colleagues and to network in formal and informal atmosphere. This year’s edition takes place on Sept 7-11 and the theme is - Media Business In the Era of Transformations: Challenges, Prospects, Opportunities. You are very welcome to register: https://kievmediaweek.com/en/registration and join this exclusive project for media market! We wish to develop our partnership soon! Take part in KIEV CoProduction Meetings Pitching 2015!!! Deadline for project application is July 24, 2015. KIEV CoProduction Meetings will be held on September 8, 2015 in Hyatt Regency Kiev (Ukraine). Curious father. Curious son. Take part in our contest and create a movie to celebrate Discovery's 30th anniversary! Since its creation 30 years ago, Discovery has been taking its audience on fascinating journeys and reminding people that everyone is an explorer and that an adventurous, inquisitive spirit should be passed from one generation to the next. Discovery has encouraged and inspired its audience to explore the world in the same way that a father would explain reality to his child. On the 1st of July we opened a contest entitled “Curious Father Curious Son” to celebrate Discovery’s 30th anniversary. To participate, you need to create a movie about a father and son’s quest to inspire each other for adventure, explore the world together and get to know each other better. The movie should show the dynamics between experience and fresh perspective, common sense and courage, knowledge and curiosity. The entries can be submitted via the contest platform TLUMTLUM.PL under one of two categories: professional or amateur. The deadline for participation is the 13th of September. Total prize pool: 30,000 PLN. The winning movies will be screened on the 24th of September as part of the second day of the Filmteractive Festival in Łódź. They will also be aired on Discovery Channel. Filmteractive 2015 is looking for volunteers! Take part in organisation of a big international event about film and marketing! Amanda Farnsworth from BBC at Filmteractive 2015! Amanda Farnsworth is a senior executive who has held some of the most high profile leadership roles in the BBC including Editor of the TV One and Six O Clock News, Deputy Editor, Newsnight and Bureau Chief in Washington DC. As Project Executive London 2012 she was responsible for developing some of the BBC’s key external partnerships around the London 2012 Olympics including with Locog and the GLA. She sat on the BBC’s 2012 Steering Group, helping to formulate the BBC's vision, editorial strategy and plans to cover all the major 2012 events including the Olympic Torch Relay, the Cultural Olympiad and the Olympic Games. Amanda is currently Editor, Visual Journalism at BBC News bringing together TV designers across all domestic and global outlets with the high end multimedia interactive projects online within News. The team won 8 awards in 2014, several of them for innovative Data Journalism projects. Amanda is also a Trustee of the Lyric Theatre in Hammersmith, West London. At Filmteractive Conference she will present the following topic:Visual Journalism at the BBC - Where TV meets the web. You have time till July 15th!!! We would like to remind you that here you can download the application form as well as get all the important information about our Market! Last week to buy your early bird tickets! Filmteractive 2015 programme is already available! 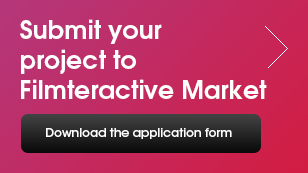 Last month to submit your A/V projects to Filmteractive Market 2015! Creating excitement around something as unengaging as washing machines is a challenge. Especially since they are only bought every 7th year on average and typically when your old one breaks down. The Next Black is an example of how a company can manage to put their products in a completely new context and tap into some of the most trendy topics out there. When home appliance manufacturer AEG (part of Electrolux) was about to launch a new sustainable range of washing machines, they shifted focus from the washing machines and launched a documentary abound the future of the clothing industry. The film has been screened around the world and renowned as "last years best fashion film". Lovisa Sunnerholm, PR manager at Electrolux and executive producer of the film will talk about the almost impossible project to launch a documentary in 5 months and the strategy behind the project that made a whole world seing "green washing" as something positive. Meet the speakers of Filmteractive 2015! Illy Coffee, Electorlux, BBC, Channel 4 and many more! "Early bird" tickets for Filmteractive 2015 are already available! Till May 31st you can buy you tickets for 270 € (including 23%VAT). Regular price tickets for 390 € (including 23%VAT) will be available form June 1st till September 16th. Filmteractive Market 2015 Call for Projects is now open! We are proud to announce the date of Filmteractive 2015! More info soon! Interesting branded content screenings at the Festival! Watch an interview with Filmteractive Market 2014 Winners! Cross Video Days 2015 Call for Projects is open! CVD invites you to submit your projects before March 16, 2015 under 8 different categories of the call for projects: Cinema & Transmedia, Interactive Documentary, Webseries & Web fiction, Cross-media TV show, Interactive Animation, Youth and Education, new category - Video Game and Other - for all the projects “outside the box”. “Komplex, 28” will be installed in their city!!! Here you can watch the pitching session of "Komplex,28"
Sign up for Filmteractive newsletter and stay tuned! Get informed about our plans for 2015 edition! Look at the right side of our website and fill in your e-mail address. Experienced Internet Licensing Specialist at Filmteractive Festival 2014! Adapting to the main theme of Filmteractive Festival 2014, which is distribution of audiovisual works in the Internet era, Anna will present: New ways of distribution, new ways of licencing. It’s a great occasion to learn how copyrights are being adapted to the dynamically changing ways of content presentation on the Web and which legal issues are most important in this proces. ZAIKS, founded in 1918, is an union of Polish authors, which from nearly a century supports creators and protects their works. This non-profit organisation not only helps artists receive their remunerations but also takes care of social activities for them. Anna’s presentation will be held in Polish. Don’t hesitate and take part in Filmteractive 2015! Call for speakers, sponsors and media partners is officially open!